A coin-cell battery (CR2032) powers the real-time clock and CMOS memory. When the computer is not plugged into a wall socket, the battery has an estimated life of three years. When the computer is plugged in, the standby current from the power supply extends the life of the battery. The clock is accurate to plus or minus 13 minutes/year at 25 degrees C with 3.3 VSB applied. When the voltage drops below a certain level, the BIOS Setup program settings stored in CMOS RAM (such as, the date and time) might not be accurate. If this event occurs, replace the battery with an equivalent one. Note If the battery and AC power fail, custom defaults (if previously saved) are loaded into CMOS SRAM at power-on. If custom defaults were not saved, BIOS setup defaults load into CMOS SRAM at power-on. Electrostatic discharge (ESD) can damage components. Apply the procedures described here only at an ESD workstation using an antistatic wrist strap and a conductive foam pad. If a station is not available, you can create some ESD protection by wearing an antistatic wrist strap attached to a metal part of the chassis. 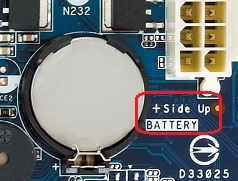 There are several styles of battery placement on Intel® Desktop Boards. To replace the CMOS battery, follow the steps for the style on your board. Turn off all peripheral devices connected to the computer. Disconnect the power cord of the computer from the ac power source (electrical outlet or power adapter). With a medium flat-bladed screwdriver, gently pry the battery free from its connector. Notice the orientation of the + and - on the battery. Install the new battery in the connector, orienting the + and - correctly. 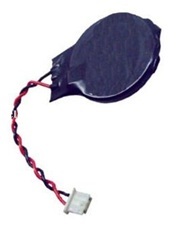 This type of CMOS battery is connected to an onboard header on the board by a Molex* 1x2 connector (51020-0200). Turn off all peripheral devices connected to the computer. Disconnect the computer’s power cord from the AC power source (wall outlet or power adapter). Disconnect the battery wires from the connector and remove the battery from the back of the I/O stack. To install the new battery, remove the paper backing from the battery adhesive pad, attach the battery to the I/O stack, and connect the wires to the desktop board. Note CR2032 batteries with a wire and connector may not be locally available. We recommend you search for online retailers by searching for CR2032 with wire or CR2032 with connector.